Now I don’t have a bookshelf at the moment. Instead, I have books lying around in bundles everywhere, tottering towers waiting to be read and ever growing ‘finished’ piles. So when I get a chance to browse through other people’s books on their accessible and easy to view shelves, I get quite excited! 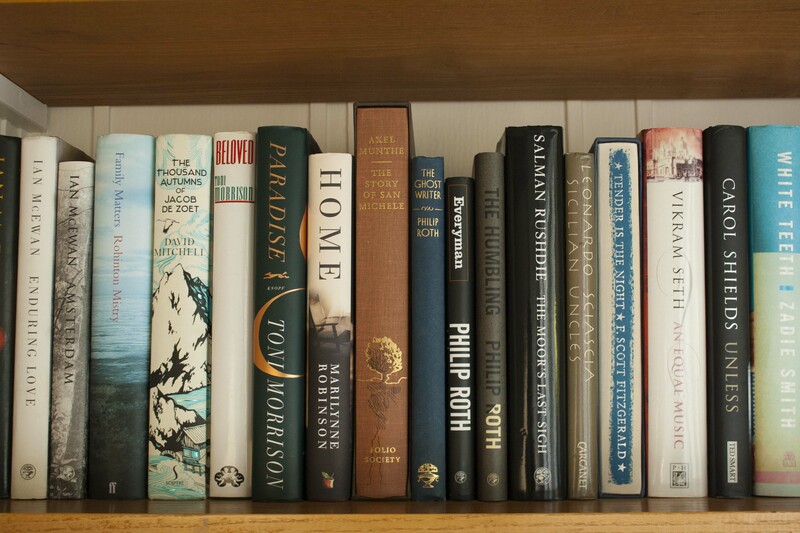 A particular house I like to visit, belonging to Mr. and Mrs. S gets me particularly excited – it’s my version of Book Heaven. 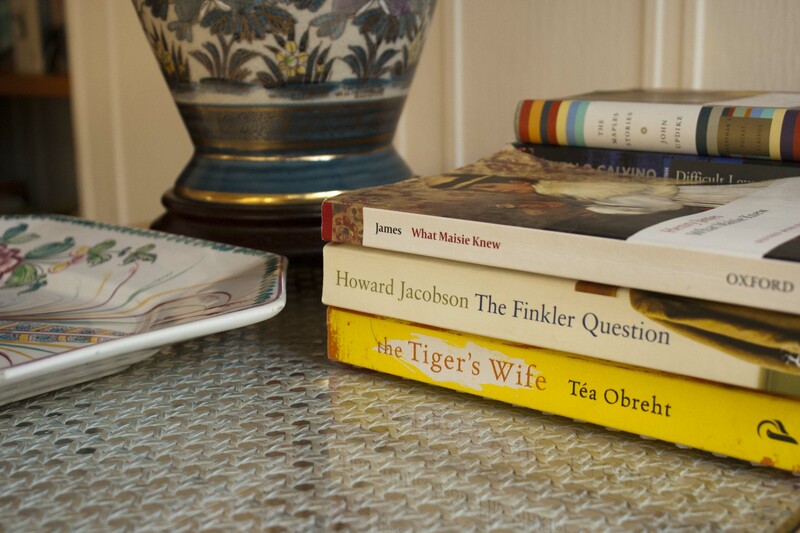 Staying with this friendly couple is a real treat for book lovers. As two voracious readers, with a huge collection and variety of books, you could spend hours wondering around the house, browsing the shelves. You also get the added bonus of book recommendations with your morning coffee and mild debates about Charles Dickens over dinner. Upon entering the house, it is immediately obvious that it is the home of big readers. The entrance hall contains two sets of floor to ceiling bookshelves, with fiction books that have been read by the couple. It is hard to walk past the selection without taking a closer look. Already I can see one of my favourite authors; Donna Tartt. 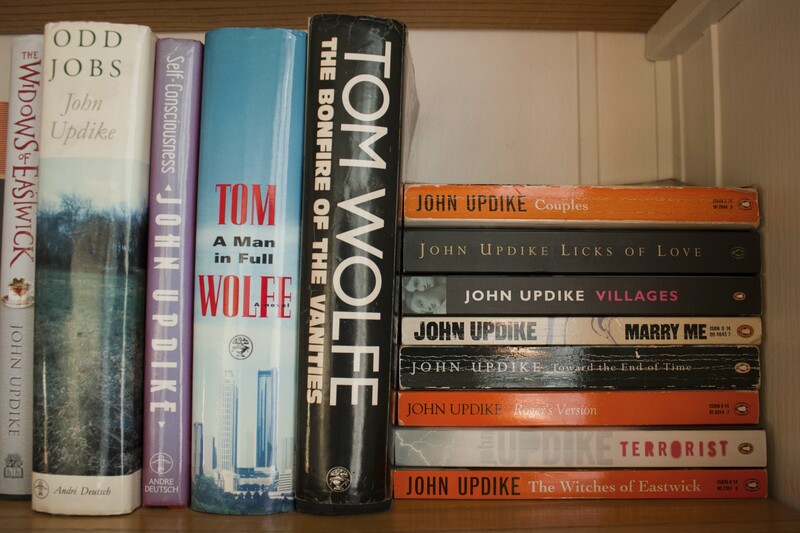 There is such a wide selection of authors that almost anyone could find something they like; Ali Smith, John Updike, Jonathon Franzen, Doris Lessing and a whole collection by Cormac McCarthy. You could actually be quite comfortable staying in the entrance hall. I could easily choose a book and sit for hours in one of the conveniently placed armchairs on either side of the coffee table – which also has something to offer. The Tiger’s Wife which was in easy reach was one that was specifically recommended and lent to me by Mr. S and is now on my pile at home waiting to be read! Moving on to the living room, and you will find a beautiful display of books and ornaments. I cannot help but think these books have been chosen and placed with care. Some of them are ancient looking with discoloured sleeves and others are in sets with their handsome spines on display. 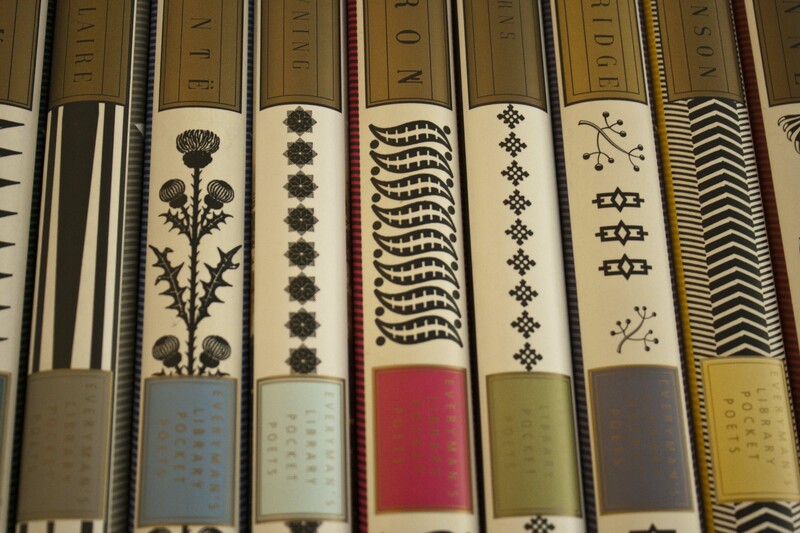 There is a lover of poetry in the house, as that is what many of the shelves are filled with. But there are also books on history, food and art. 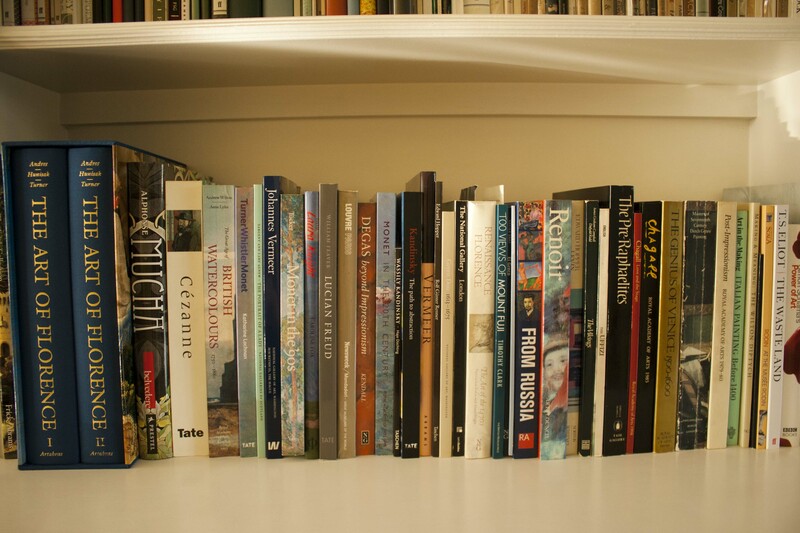 I found the art books in this room to be particularly interesting – and there is almost more choice than in my local Waterstones! When the night comes, and it is time for me to disappear off to the spare bedroom at the top of the house, I am always happy to take a look at what’s on offer on the coffee table. There is always something interesting! The shelves in this room are jam packed with travel books. I usually look through these when thinking about my next holiday. Having a sneaky look around the rest of the rooms, I love to see what other treasures I can find, whether it is a collection of old children’s books or long forgotten favourites. And of course, I love to find unexpected books in unexpected places! Mr. and Mrs. S are very aware that I am a bookaholic and don’t mind me rummaging through their bookshelves. They were also pleased to answer a few questions about their incredible book collection! What are you reading at the moment and what do you think of it so far? Mrs. S: I am reading The Sense of an Ending by Julian Barnes. I haven’t read much of it yet. Incidentally, I am reading it on my new Kindle, which is great. The book looks very promising and is very easy to read. It looks back on a lifetime and how the actions of youth can have repercussions in later life. Naturally, this type of content is always interesting for an older person like me. Mr. S: The Marriage Plot by Jeffrey Eugenides. Thoroughly enjoyable. 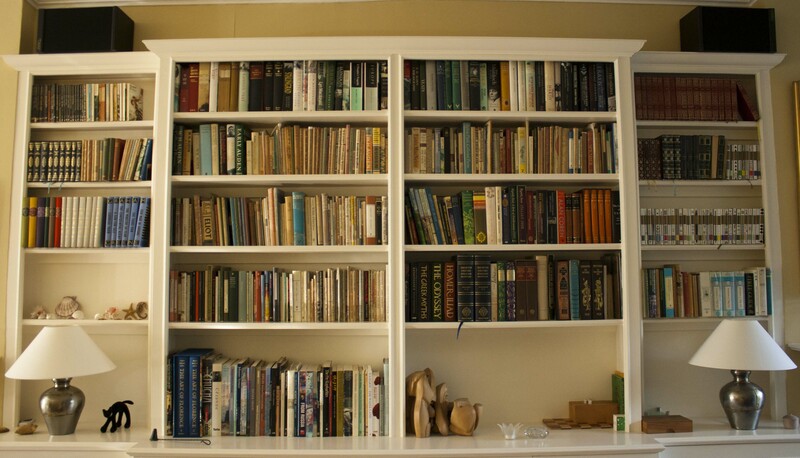 How do you organise your bookshelves? Is there any particular order? Mrs. S: Our books are organised by category. 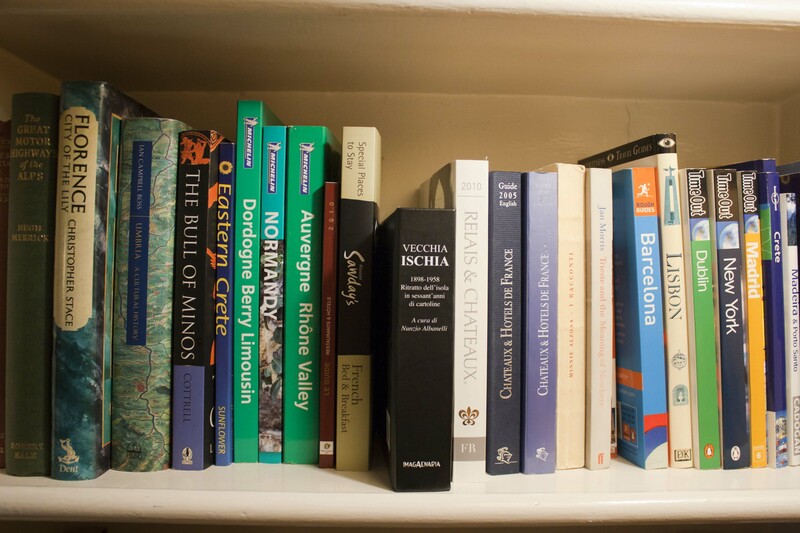 For example, all our travel books are at the top of the house, together with language books, philosophy and some other reference books. Fiction is mainly downstairs and in alphabetical order. Most of our art books are downstairs too, but this is because these books are big and so are the shelves that house them! Mr S. is the chief librarian in this house. The books I use for work, teaching a variety of pupils, are organised by age group. Mr. S: In sections: fiction (alphabetical order by author), poetry (ditto), travel (by region), biography (alphabetical order by subject) history (random). This system helps me find books quickly, but is quite boring. I’ve come to the conclusion that my books should not be arranged as if in a library or bookshop, but totally randomly. This would be great for browsing and might throw up some fascinating juxtapositions. I just don’t have the courage to do it! You have a lot of books. What percentage of the books you own do you think you have actually read? Mrs. S: I have probably read 50% of the books we have. Mr S. is a faster reader than I am! But then I need never buy another book as long as I live! Mr. S: All but the last five volumes of Gibbons’ Decline and Fall of the Roman Empire and the last two volumes of Proust. I’m persevering slowly with Joyce’s Ulysses. How do you go about choosing a book? And where do you buy / borrow them from? Mrs. S: I read reviews which sometimes inspire me. I also have many authors I really love and can’t get enough of. However, I am conscious that this does not always give me enough exposure to new talent or adequate opportunities to explore a variety of genres. I am often inspired by the travelling I have done. I like nothing better than to read about a new place when I’m actually there. The book Midnight in Sicily by Peter Robb enriched my recent visit to this unique and fascinating island more than I can say. Mr. S: I buy all the works of certain authors as they come out (Roth, Eugenides, Frantzen, Tyler, Hornby, Atwood, Amis, McKewan, Heaney etc.) and rely on reviewers to point me to new voices. I’ve just subscribed to And Other Stories (www.andotherstories.org ) which selects four manuscripts a year that have been rejected by the major publishing houses and publishes them itself. Gold dust! Friends invariably recommend rubbish (Dan Brown, Cornwall, Coelho, Scandinavian detective miserabilia etc.). Which one book do you treasure above all others? Mr. S: None and all. A read book is a husk from which all the goodness has been sucked out and stored somewhere in your mind. 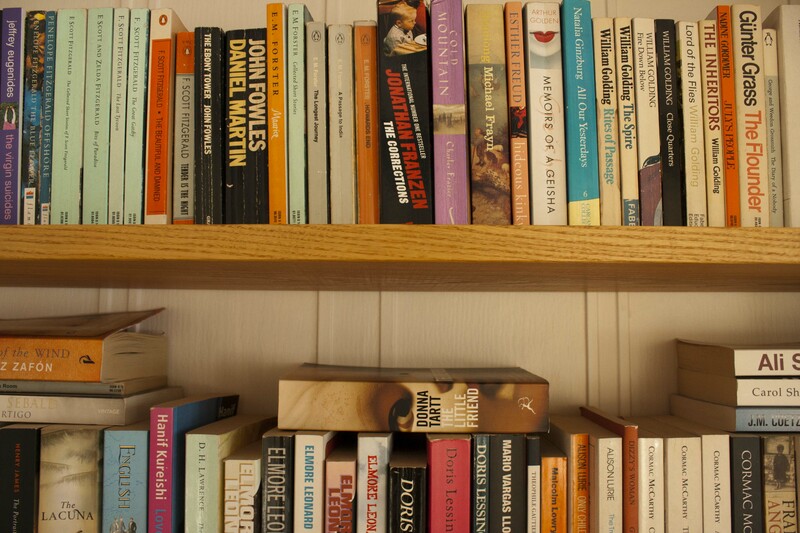 We retain read books on our shelves to remind us of where and when we read it, who we were with at the time, what we felt when we read it and (rarely) how it changed our lives. As such, every book we keep is a personal souvenir. There is a secondary reason, often disavowed: we keep our books to show people the sort of person we are, or, more accurately, the sort of person we want people to think we are. They become part of our personal marketing, our impression management. And finally, what book should I read next? Mrs. S: Having read your admirable reviews and comments about some of the books you have read, I can see that your taste is not only catholic, but also ambitious and serious, ( in a good way). I would therefore suggest something which would be an exploration of English speaking writers from outside the British Isles. I would recommend The Sound and the Fury by William Faulkner. It is an American book told from the point of view of a child who has learning difficulties. A very different book, by the American author, Annie Proulx called The Shipping News might be a slightly more light hearted choice. You could read anything by Doris Lessing, the great South African writer; The Golden Notebook is my favourite. The other South African writer also worth reading is Jan Coetzee, Disgrace is his best book, in my opinion. Perhaps that’s enough for now! Mr. S: The Marriage Plot by Jeffrey Eugenides. It’s about reading and relationships – what else matters? Thank you for letting me snoop through your bookshelves! To snoop through more bookshelves, click on the link below! Me too! At the moment, the only organisation I have is – Finished and To Read. These recommendations will keep me busy with books for years! I wonder what it’s like to be brought up in a house like that…Great article! All this worming around books has made you quite the wordsmith! I know, even in the bathroom! The Sound of Fury is definitely one I’ll get around to this year. Thanks for the comment. So many books to read, so little time! This inviting home demonstrates precisely how a Kindle simply cannot replace books! This is my kind of home.